Amaranthines Elliot Arrangement is a striking gift in whites and purple blues, perfect for the celebration of a new bundle of joy! 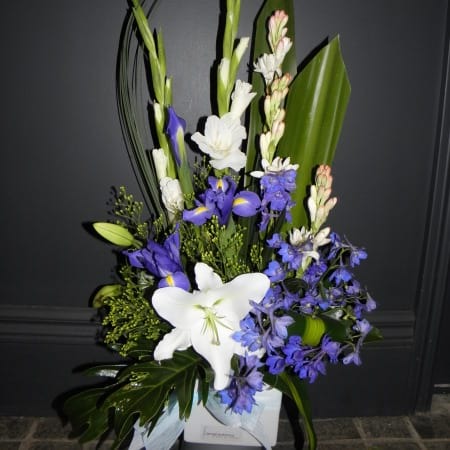 With tall foliage of the gymea leaf and white gladioli, purple iris and delphinium the arrangement is finished with the long lasting and fragrant white oriental lily. A stylish and unique design from Amaranthine Flowers By Design, New Lambton Newcastle. Same day delivery, six days a week, available to all areas of Newcastle, Lake Macquarie and Maitland, includes John Hunter Hospital, Newcastle Private Hospital, Charlestown Square, Lake Macquarie Private Hospital, Maitland Hospital and Mater Hospital.